It’s 5 am and an alarm is buzzing in your ear. What do you do? Slap the snooze button? Or wake up ready to workout. Most people opt for the snooze button although they may want to run the track or hit the weight room. So why can’t the second choice be as easy as the first one? The answer might lie in something called a habit loop. It turns out there is a lot of science behind this early morning decision. The answer may not simply be because of tiredness. Power of Habit implies a much stronger force is at work. 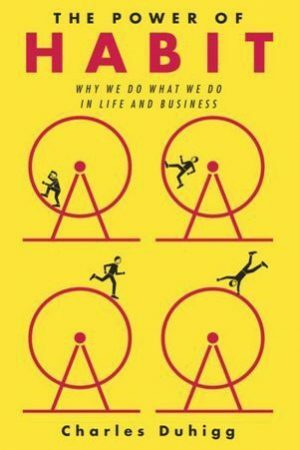 Charles Duhigg’s book The Power of Habit: Why We Do What We Do in Life and Business digs into the tricky science behind these habits. As a Marine, I find habits and the development of good, powerful habits to be interesting. The Marine Corps tries to instill habits of thought and habits of action into the young men and women who join its ranks. According to Duhigg, the Marine Corps is on to something significant. It turns out that habits do begin in the mind in the form of mental feedback loops. These loops are incredibly powerful. There is a cue. The cue triggers a routine. The routine is followed by a reward. With this feedback loop comes the formation of both good and bad habits. For example, a good habit might be an alarm goes off (the cue), the gym clothes go on (the routine), then a person gets a good workout in (the reward). As Duhigg notes, the power of habit isn’t always the reward. Instead the power of habit can be the anticipation of the reward. On the negative side, take a bad habit like smoking. Smokers have a difficult time quitting not because of the nicotine but often because of routines that have been built around the anticipation of nicotine. For example, consider a smoker who has a cigarette every morning at 9 a.m. after driving to work and finishing their morning coffee. It becomes extremely difficult for that smoker to quit unless they stop driving to work every morning at 9 a.m. and drinking their morning coffee. The reason is because the cues trigger the anticipation of the reward i.e. the morning cigarette. As a Marine, I found this portion of the book valuable. It helped me to understand why certain habits that the Marine Corps standardizes are so powerful. Moreover, they have long lasting impacts on the individuals who join the organization often breeding life long skills of discipline and hard work. Before reading the book, I expected to find more value in the section on individual habits. I was wrong. Part Two on organizations and the keystone habits chapter made the book worth the purchase. I learned a lot as a leader from this part. Duhigg did an excellent job explaining some fascinating business case studies. In particular, the story of Paul O’Neill was outstanding. Paul O’Neill became CEO of Alcoa (Aluminum Company of America) in the late 1980’s. When he got to the company, he decided to focus solely on workplace safety. At the time that he announced this initiative, Wall Street investors panicked. Duhigg says that they thought, “Who put this crazy hippie in charge?” But, what the shortsighted investors didn’t get was that Paul O’Neill was creating what Duhigg calls a “keystone habit.” As it turns out, focusing on the keystone habit of workplace safety was immensely profitable. In fact, by the time O’Neill left Alcoa, the companies stock value had gotten five times bigger and the company had achieved a valuation of $27 billion. The keystone habit of workplace safety was the cue that caused multiple second and third order effects throughout Alcoa. Communication channels improved through timely and accurate reporting. Old equipment and manufacturing parts were replaced. Waste was cut in daily operations. As a result, profitability soared through improvements across the organization. As leaders, we can look at our own organizations and find certain “keystone habits” to focus on. Perhaps in the military it is focusing on specific unit SOPs. Although what seems to be overlooked by Duhigg is the fact that O’Neill as a leader prioritized safety as a keystone habit. Alcoa had a safety program prior to O’Neill, but it wasn’t a priority. For leaders, we don’t always have to look at adding something new or reinventing the wheel in a dramatic way. Sometimes prioritizing the basics is what matters. In fact, the Marine Corps likes to call this “brilliance in the basics.” Being good at doing the little things right can itself be a keystone habit. I found this chapter extremely valuable. According to Duhigg, Starbucks has created many powerful habits. In fact, Starbucks has created a system for its employees to deal with disgruntled and rude customers. One of the techniques is called: LATTE. Listen to what the person is saying. Acknowledge their concerns. Take action. Thank them. Explain what happened. Duhigg’s point is that Starbucks has sought to give their employees a habitual tactic to maintain a kind and positive customer service. Before reading this book, I didn’t expect to learn self-discipline techniques from Starbucks baristas. But, Duhigg brought me there. In the military, we focus on things called immediate action drills. There is a natural crossover between business practices and the military procedures in this case. Starbucks employees have their own immediate action drills. They train to use these drills when dealing with the challenge of unruly patrons. This becomes habit with time and ensures that the employee can fulfill the Starbucks mission of quality customer service. In the same way, Marine units train to use immediate action drills so that certain actions become a matter of habit. For example, taking contact from the enemy or reacting to sniper fire. Each action from the enemy triggers a trained response from the unit. This powerful habit allows the unit to regain initiative and accomplish its mission. The final section of Duhigg’s book focuses on societal habits. In one chapter, he tells the story of Rosa Parks and the Civil Rights Movement. He also intertwines the experience of Rick Warren, who built a megachurch known as Saddleback Church in Orange County, California. Duhigg focuses specifically on the social habits that allowed Civil Rights marchers to successfully boycott the Montgomery buses and eventually set the conditions for civil rights legislation. In the case of Saddleback, a socialization process developed around small groups in church members homes. This helped Saddleback grow from one man and his family into a congregation of over 20,000 people. The key takeaway from this section was the importance of peer pressure in creating powerful habits. Network effects can bring about sweeping social change. In thinking about the Marine Corps, I reflected on the recruiting process. Often we see Marines that are second or third generation Marines. They are not the first in their families to join. Also, a lot of Marines have siblings that joined too. Families create a natural social pressure for an individual to join. However, for a recruiter to get individuals to join with no prior connection to the Marine Corps, focusing on trying to get a group of friends committed seems to be the best method. The peer pressure from one or more members of a social group creates a powerful incentive for commitment. Duhigg’s writing style is entertaining and informative. There is a lot of good cocktail party conversation in it. Specifically, the chapter on retail giant Target predicting when a woman is pregnant was very interesting. If someone is looking for a book to better understand personal habits, then the Power of Habit is a solid read. I also highly recommend it to military and business leaders because of the organizational habits part. In particular, the keystone habits chapter stands out as a must-read in what is, overall, a very enjoyable book.